I know I should have a card to share with y'all today. I've just been so focused on fiction writing again. It's felt really good. I've completed the rough draft of my new novel in 15 days! I love when the words pour. I'll know in January how many are salvageable. I am taking the month of December Off. I need to revamp the office, my work schedule and a couple other things so that I can be more productive in all areas while still trying to enjoy the Holiday. I hope all of you have the most blessed Holiday season. See you on January 1st with a whole new routine! I spent a bit of time in my studio yesterday. I had almost forgotten how much fun matching up images, cardstock with the right bling, and fibers was. But I knew I had to attend the Tea Party. Marylou is a wonderful woman with so much medical strife in her life. Thank you, Soni for bringing MaryLou to the party. Marylou not only loves bears but the colors blue and purple, vintage and her Faith. It helps that she's married to a minister. Bill is one of the kindest people you'll ever meet and devoted to his wife. So today's cards are for Marylou. May she be flooded with love and good wishes. I used SU Concord Crush and Very Vanilla. 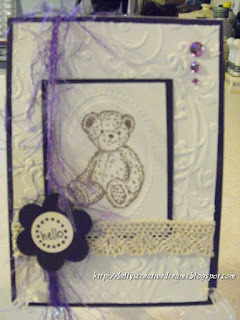 The base vanilla is embossed with Starry Night and I used the mini oval framelit to showcase the Teddy Bear by Stampbendous. I stamped him in Memento Rich Cocoa. The Hello in the center of the flower is from a flower set by Stampendous. I added bling, vintage lace and frilly fiber.